Small and Flexible! The Trig TY91 takes up minimal space and weight. The use of a control head and separate radio hardware unit provides more installation options, especially when space is at a premium. 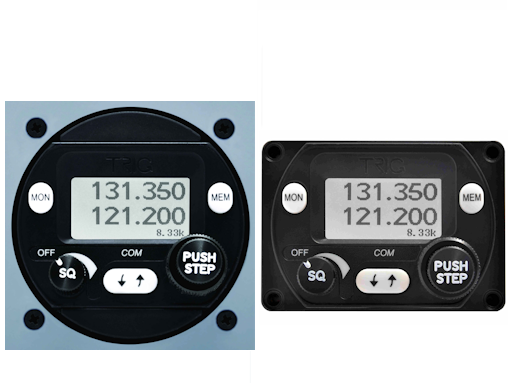 The control head can be conveniently mounted in a standard 57mm round hole or even smaller compact mount. Fitting is straightforward, and once installed the depth of the radio control head is only 74mm. 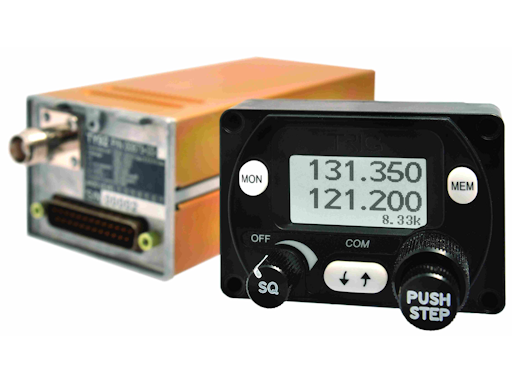 In practice this means that the Trig TY91 control head can be located in an aircraft instrument panel where a ‘single box’ radio will simply not fit. - Low size and weight (460 gr. ), with flexibility of installation options. - Simple operation via positive controls, can be easily operated whilst wearing gloves. - Dual watch function, allowing the monitoring of the standby frequency. - Includes a two place intercom. - Includes a built in speaker amplifier, allowing the option of headset free operation. - Crisp display, visible in all lighting conditions. - Dimensions: controller H 44 x W 63 x D 35 mm (74 mm depth in panel with D-Type connector fitted). Radio unit H 48 x W 66 x L 160 mm (inc. socket).